Pro-gaming is hard. You gotta be good. You gotta train hard. But, like for any sport, it doesn't last forever. 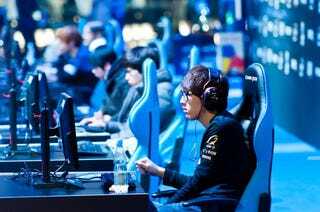 A handful of StarCraft pros have taken a rather unusual post pro-gaming career path in South Korea: The entertainment industry. For years now, StarCraft has been incredibly popular in the region—not just playing it, but watching incredibly talented folks play it. As noted by tipster Sang, many eSports athletes try to go into coaching or take jobs in the private sector that are completely unrelated to gaming. However, there are a couple of former StarCraft pros who have parlayed their gaming success into second acts as TV and music celebs. Guillaume Patry (aka Grrrr...): Hailing from Canada, he once retired to take up professional gambling like former StarCraft pro Bertrand Grospellier, but apparently he ended up taking a corporate job. Recently, however, he's began appearing on Korean program Non-Summit, which features Non-Koreans talking about life in the country. As you can see in this clip, Patry speaks quite good Korean. Lim-Yo-hwan (aka BoxeR): As far as eSports players go, they don't get much bigger than BoxeR. In recent years, he's popped up on Korean variety television and has also made the move to professional gambling. Of course, both BoxeR and YellOw were very well-known during their pro-gaming days. Photo: Przemek Tokar | Shutterstock Thanks, Spacegy!